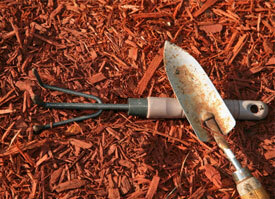 Landscapers and gardeners need two things in early spring: mulch and topsoil. Corner-Copia’s got it. Lots of it. We have triple-ground organic root mulch, dyed black hardwood mulch, licorice root, and hemlock mulch available in bulk. Delivery’s free for six or more cubic yards within five miles. Corner-Copia also has bulk topsoil in two grades – a standard soil perfect for most applications and a high-grade garden soil rich in compost and chock full of nutrients. Don’t need so much? Buy it by the bag. We carry a full-line of bagged mulch, topsoil and compost from Scotts, Miracle Grow and other partners. Check out our bulk prices below. and call us at (609) 426-8884 with questions or to place an order. Organic Root Mulch – Triple-ground $25/cubic yard. Free delivery for six or more yards within five miles. Dyed Black Hardwood Mulch – $32/cubic yard. $25 delivery charge per load within five miles.